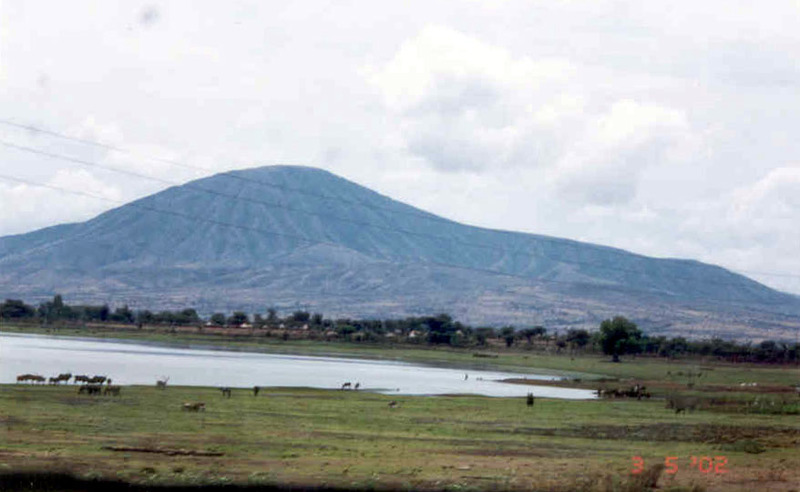 For spring break during my junior year me and my mom went to visit my aunt and uncle in Ethiopia. This was an amazing trip - one of those life-changing experiences. 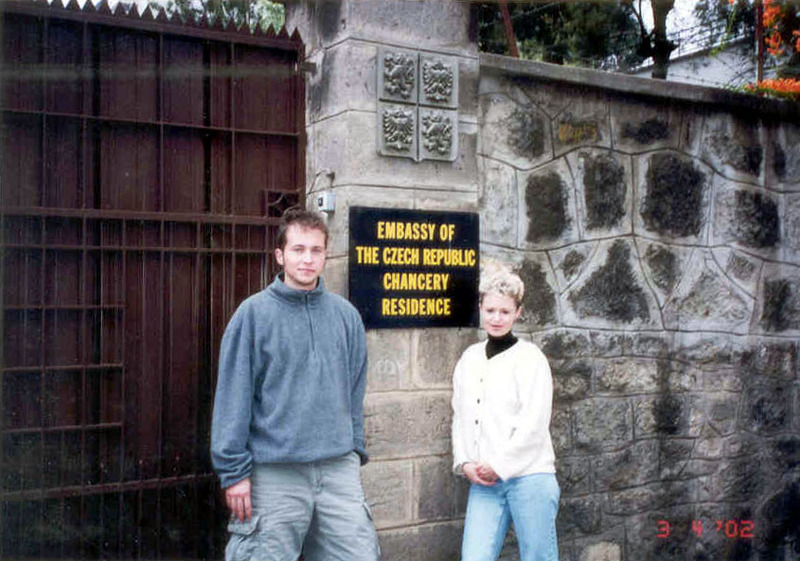 My uncle was stationed in Ethiopia working for the Czech Embassy and invited the whole family to come visit him. Originally, I was supposed to meet my dad and my other aunt there, but they decided not to come at the last minute. They really missed out! We took off from D.C. and flew over to New York. There we picked up more passengers. Next, the plane stopped in Rome, where it re-fueled and the crew changed over. Thanks to this delay, we crossed over the Mediterranean Sea to Africa just as a new day was beginning. 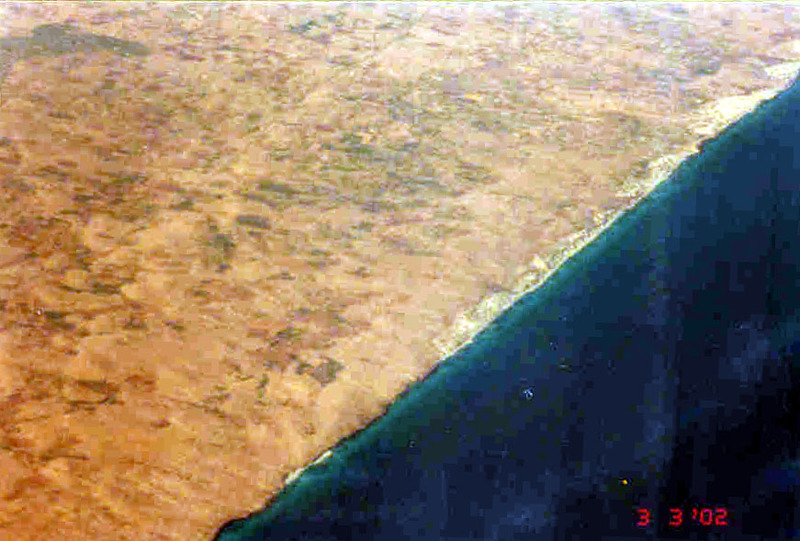 This is the coast of Africa (probably Libya). As the day went on, the desert began to heat up. 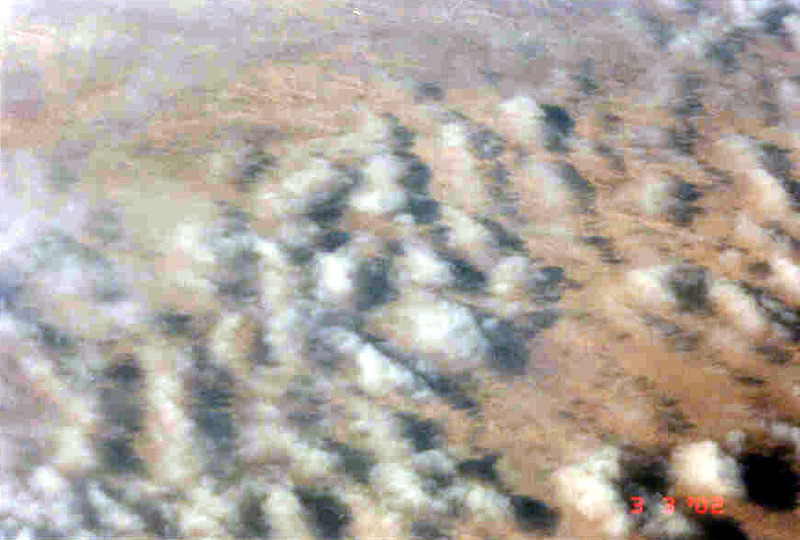 This caused an impressive display as small clouds began to form and rise from the surface. 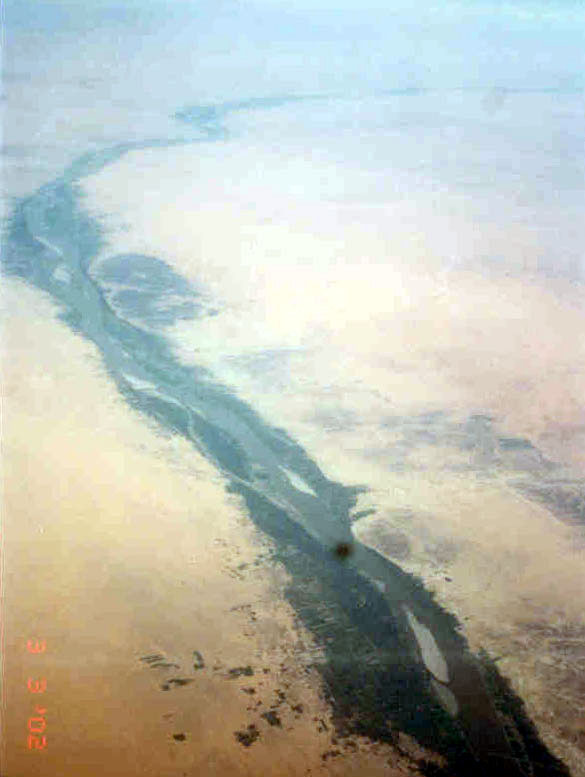 Flying over the Nile. Those gray areas close to the river are plantations. Here we are flying over Ethiopia, on final approach to Addis. 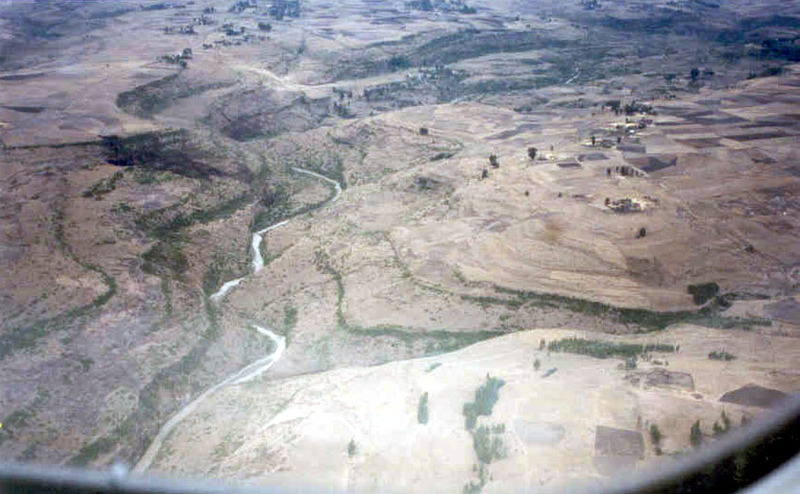 Ethiopia had a very distinct look from the plane. It was much greener and more hilly than any of the other countries we flew over. Seeing all this green also made me realize just how vast the Sahara is. 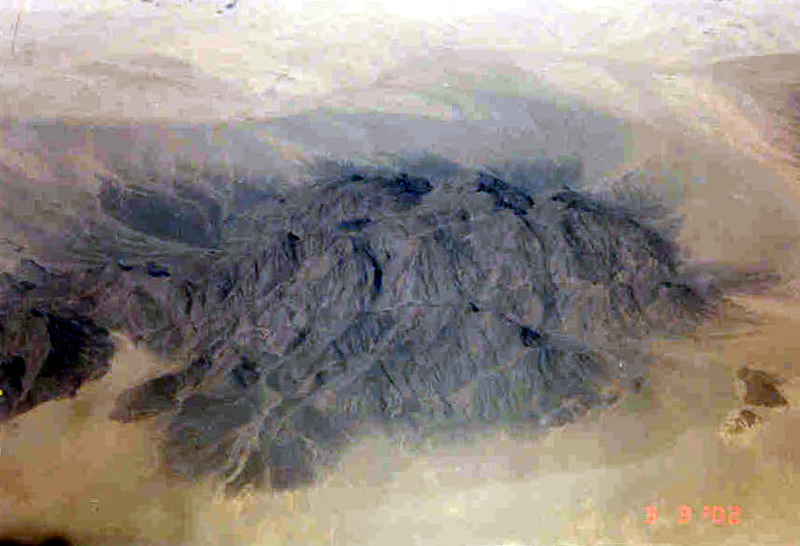 It took the plane about 4 hours to fly over the desert. Here is a view from my uncle's house in Addis Ababa. Most people live in simple houses in crowded neighborhoods. 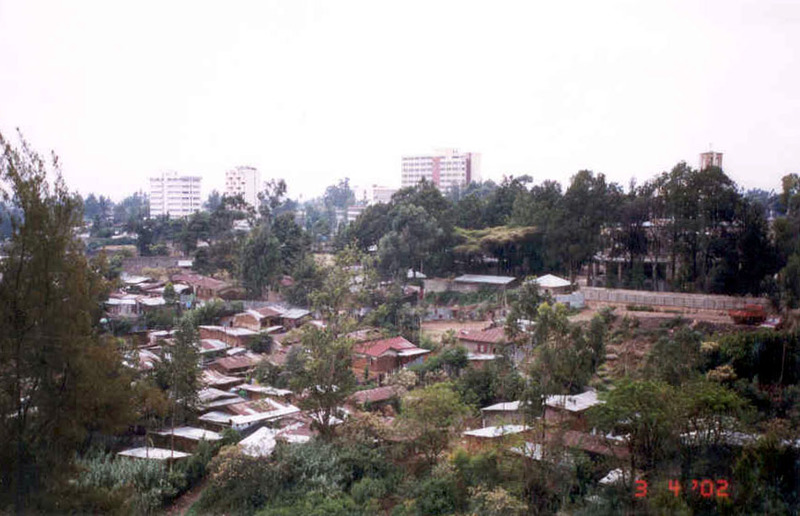 Addis Ababa, which stands for "new flower" in amharic is located about 8000 feet above the sea level. 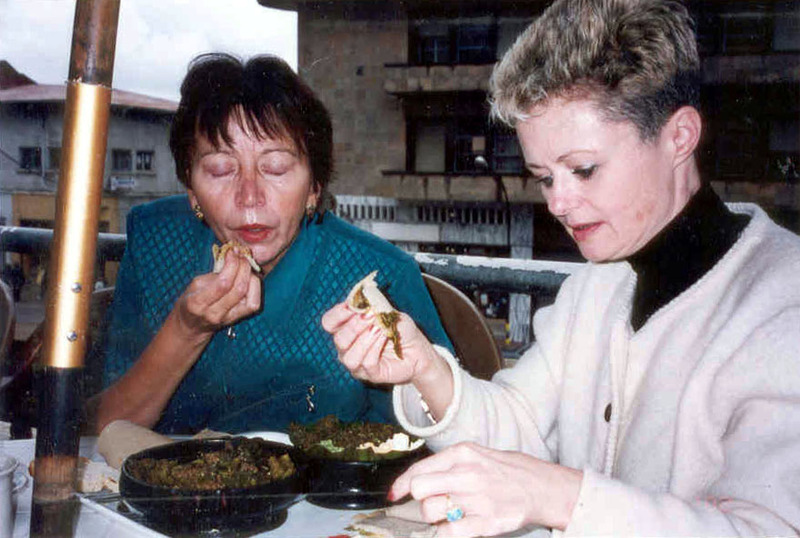 Here is my aunt and my mom eating injara. Injara is the traditional ethiopian food. It is a sour, spongy "bread" that is used to spoon out meat and spices from food bowls. Next we visited the Africa Hall. 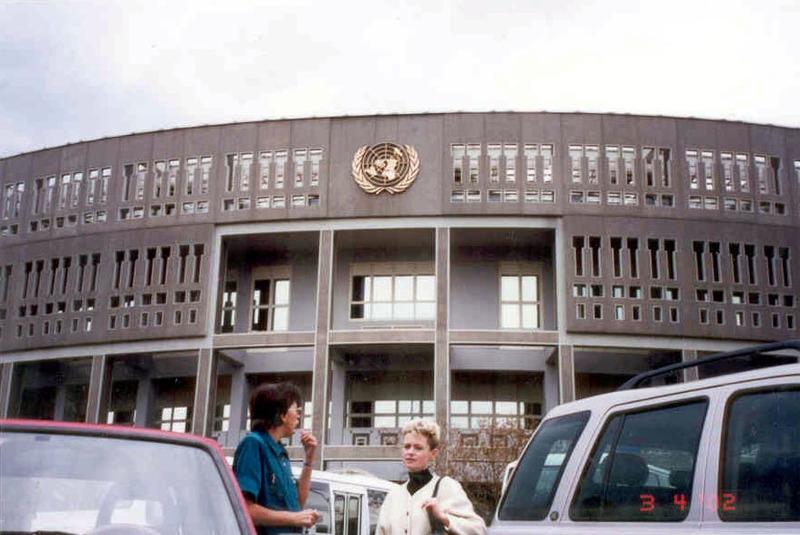 This is an example of United Nation's charity funds put to use. Instead of improving country's infrastructure or purchasing new technologies, the money was used to build this giant conference hall. Just about the only thing that I didn't like about Addis was the amount of contrast between the wealth and poverty. 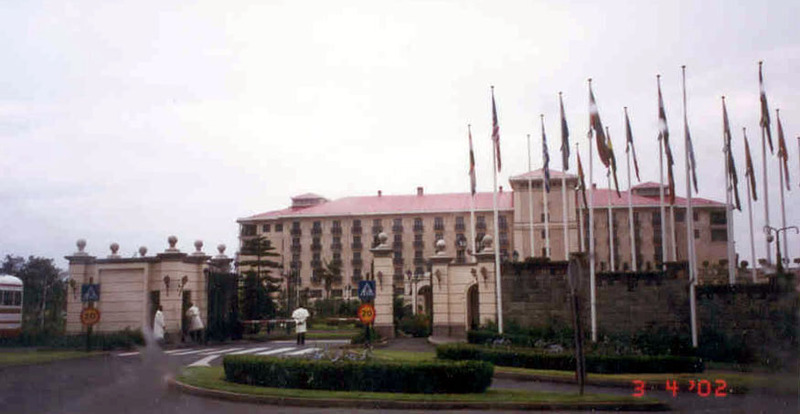 Nothing depicts this better than the Addis Sheraton (left). We walked through the hotel and it surpassed anything I've seen in Las Vegas - gold plated doors, shiny hallways, large green park area with pools and jacuzzis. And then - right in front of it, is located another poor section. 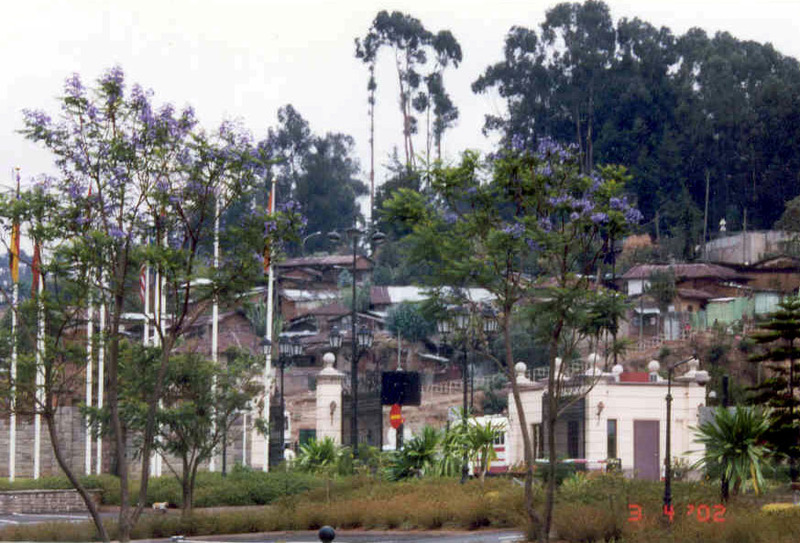 Those flag posts in the picture of the slums (right) are the same ones seen in the picture of Sheraton. 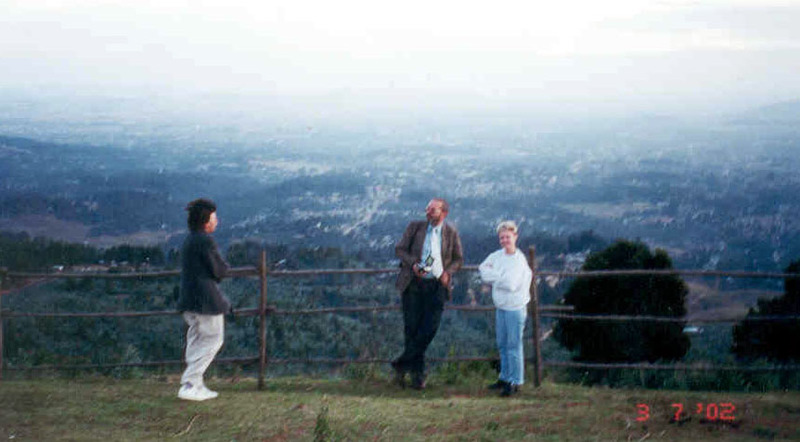 Next day we left for a two day trip to lake Langano some 215 km away from Addis. 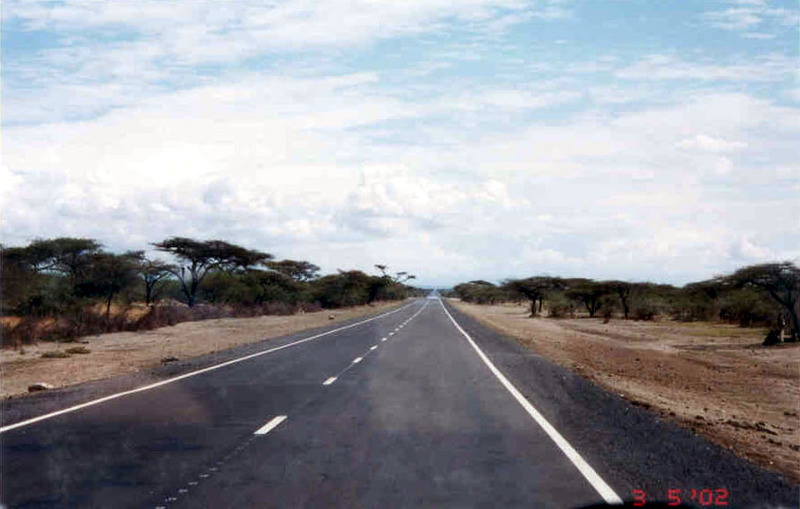 This is a typical scenery of Ethiopian roads. No picture can do justice to the livelihood of the villages. Roads are filled with cows and sheep, cars are passing all over, trying to avoid pot holes and livestock while road side merchants are advertising their crafts. The strangest thing we experienced after coming back to the States was how quiet everything was. And we made it. This hill is overlooking the lake. 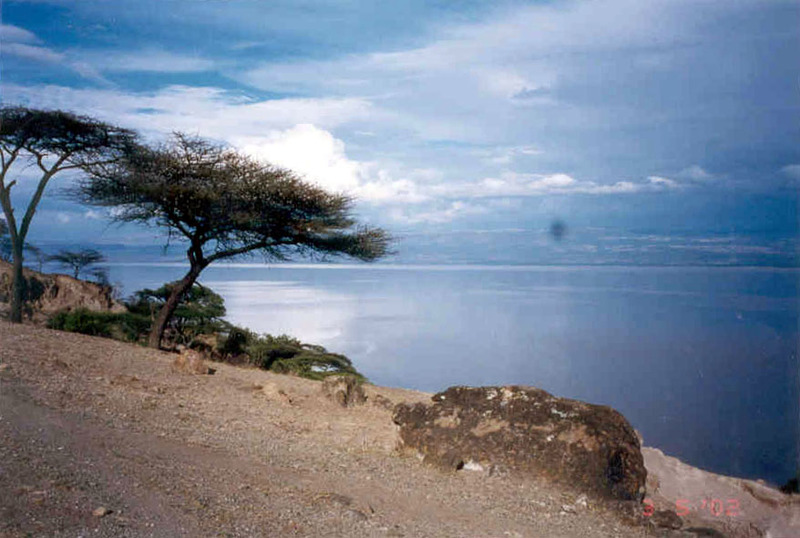 Me and Abanet climbed the hill overlooking the lake (see 2 pics up). 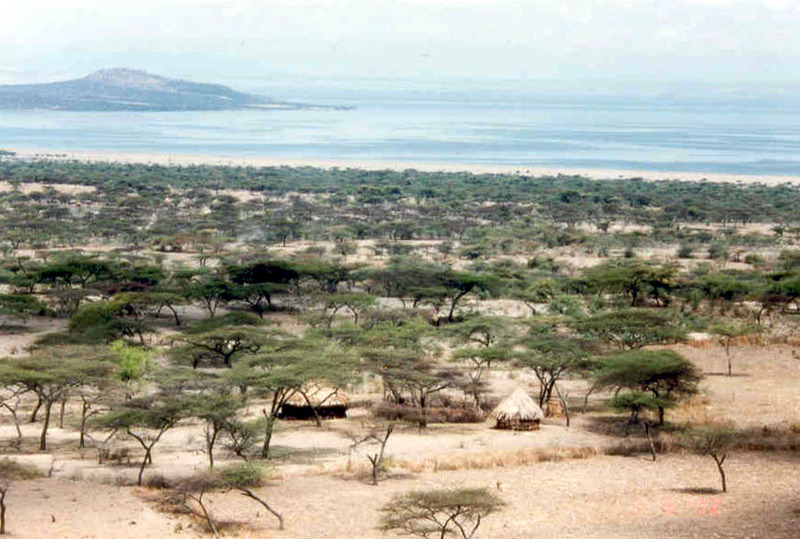 This is a view of Langano from the top. Next day we went to Abayata park, right across from Langano. 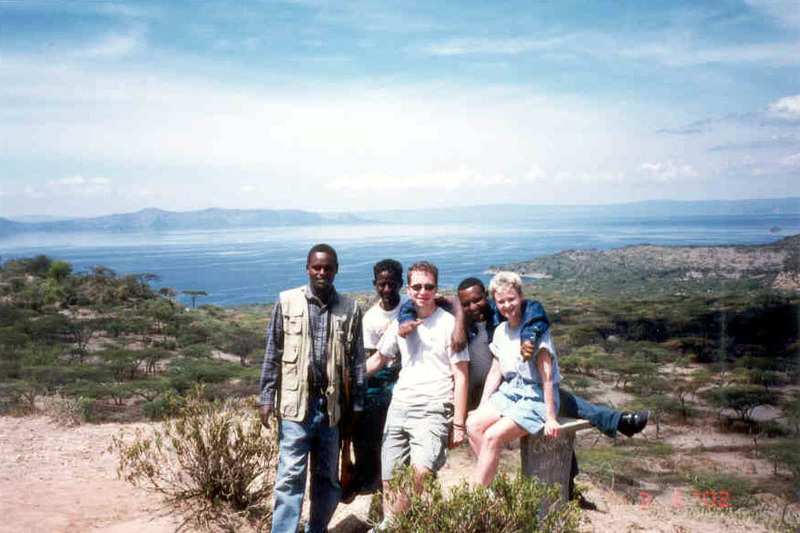 Here is our park guide, Abanet, me, Solomon and my mom in front of one of the lakes in the park. Water temperature in these hot springs was a whooping 95 degrees C. That's only 5 degrees below the boiling point! 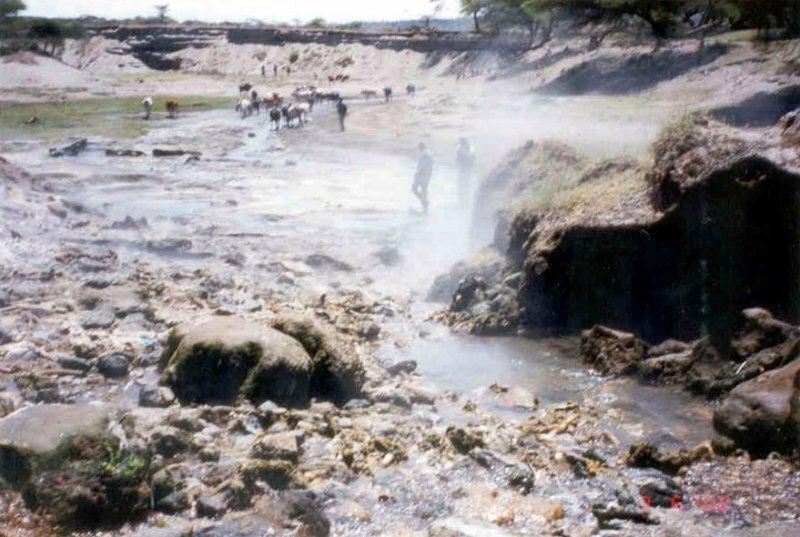 The creek was filled with egg shells and corn cobs as this is how locals cook some of their food. 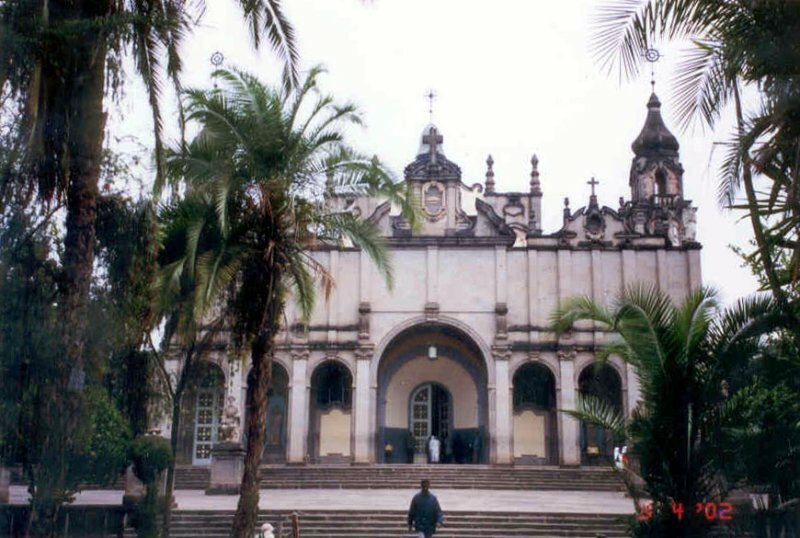 Next day, after coming back to Addis, we went to the National Museum. 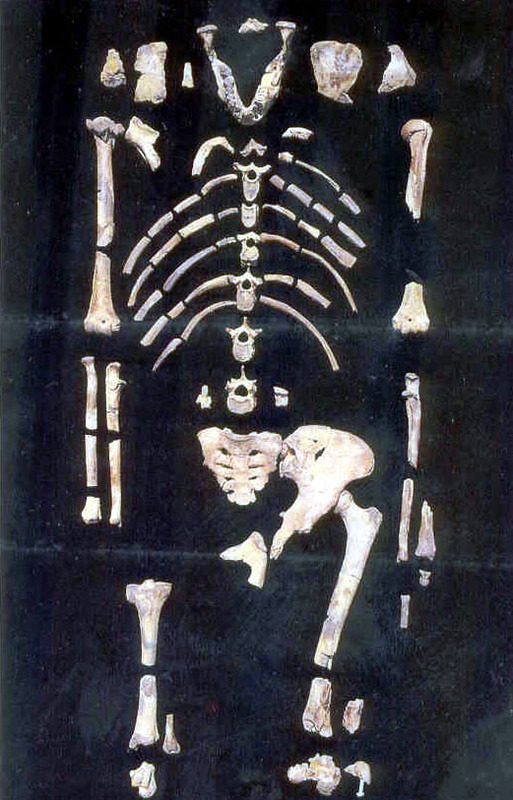 This is "Lucy", skeletal remains believed to be 3.5 million years old. 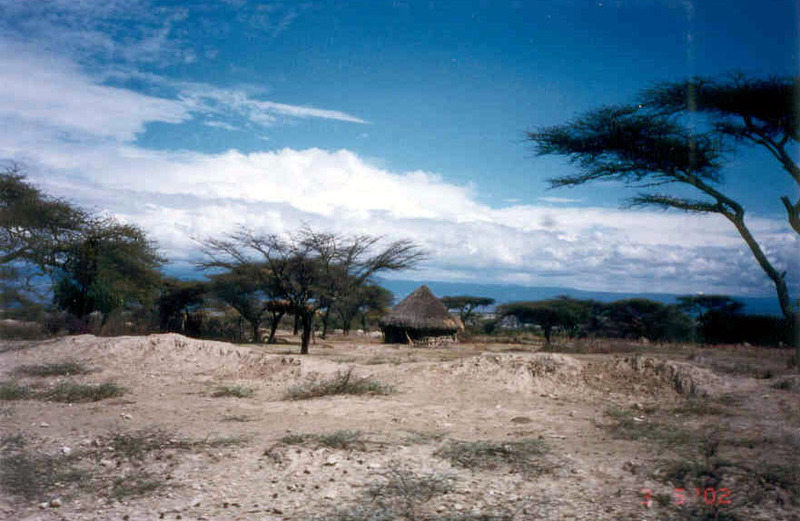 Next day we left for a two-day trip to Ambo which is a recreational area and also a source of mineral water springs. 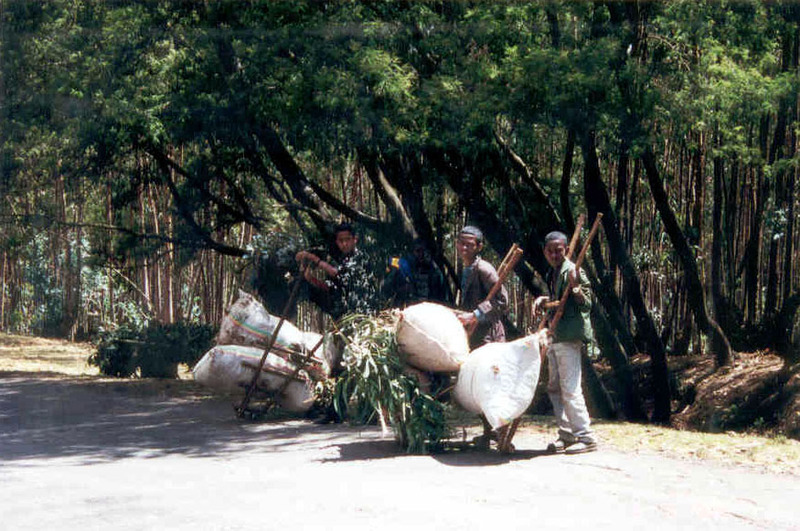 We passed these kids moving bags of eucalyptus. 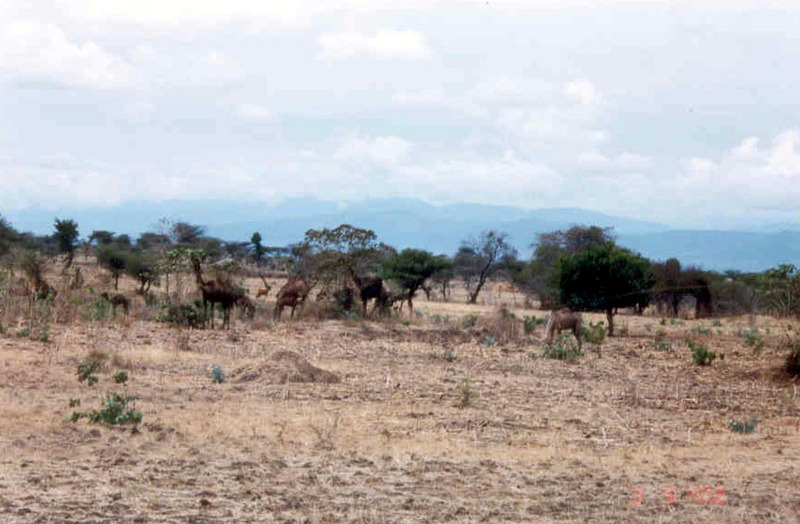 Ambo is about 125 km from Addis. We also passed a good number of tanks on the way. 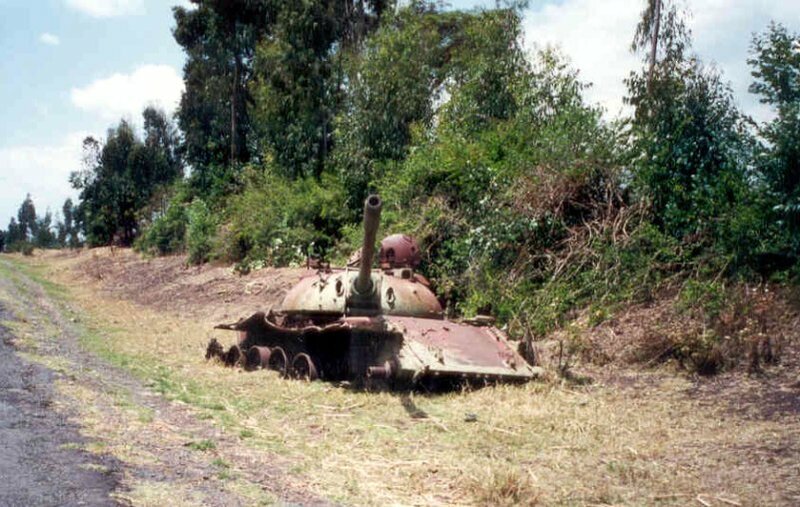 These rusting wrecks are remains from a civil war between Ethiopia and Eritrea. 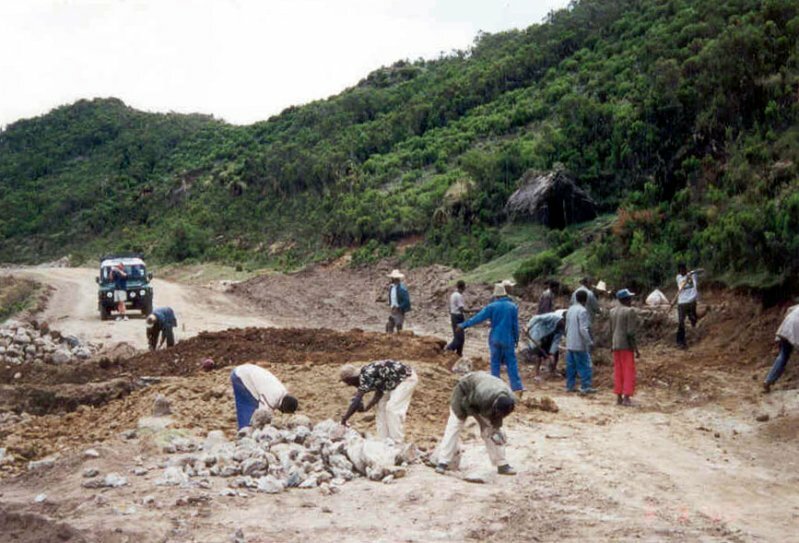 On the way to Wonchii, a crater lake by Ambo, we got delayed by locals clearing a ditch on the road. An old Toyota truck got stuck here and they had to dig it out. 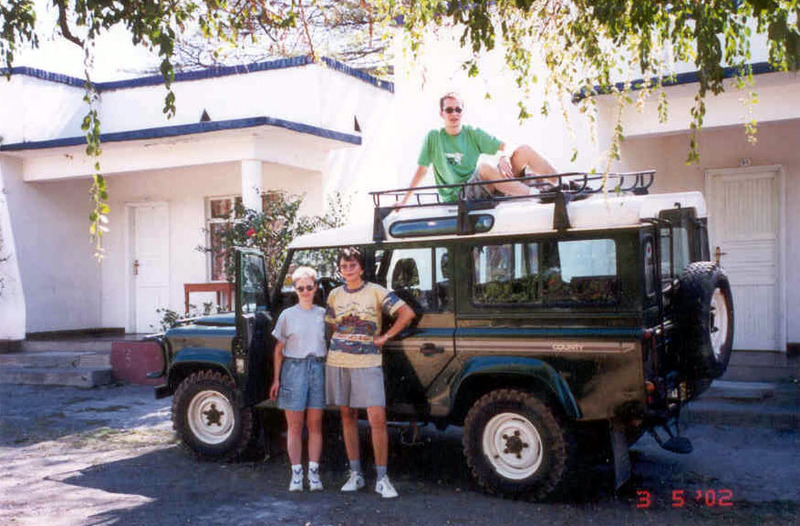 Ironically, our Land Rover got stuck coming back from the lake and we had to get the driver of that Toyota to drive us back to the top. 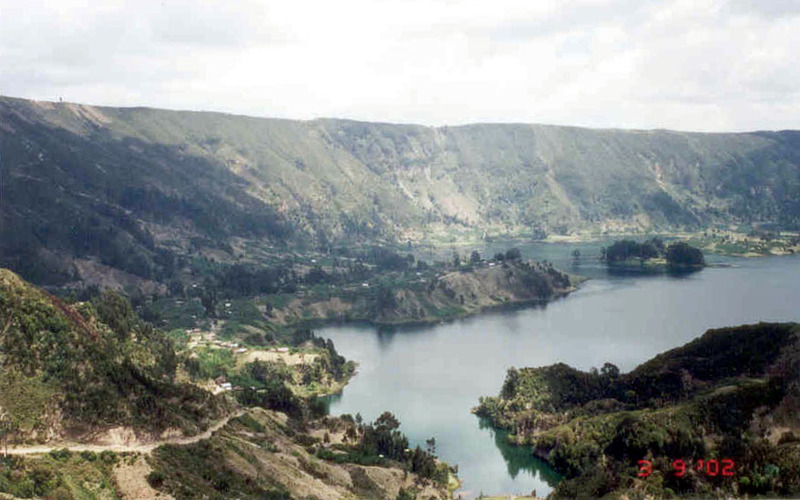 Wonchii crater lake. That dirt strip on the left is a "road" we took to the bottom. Let's just say that was not a road meant for cars to be driving on. And that's it. We saw monkeys on the way back, but I was out of film. 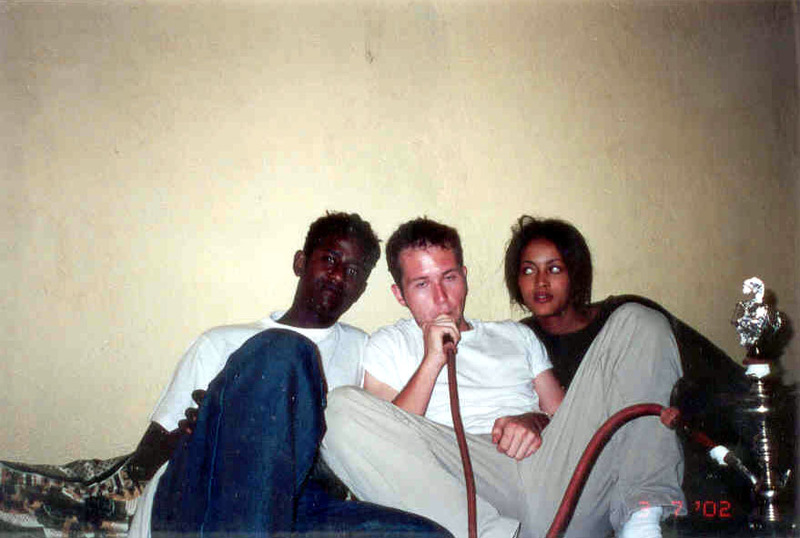 I was in Ethiopia only for 9 days but it felled like I was gone for a month. 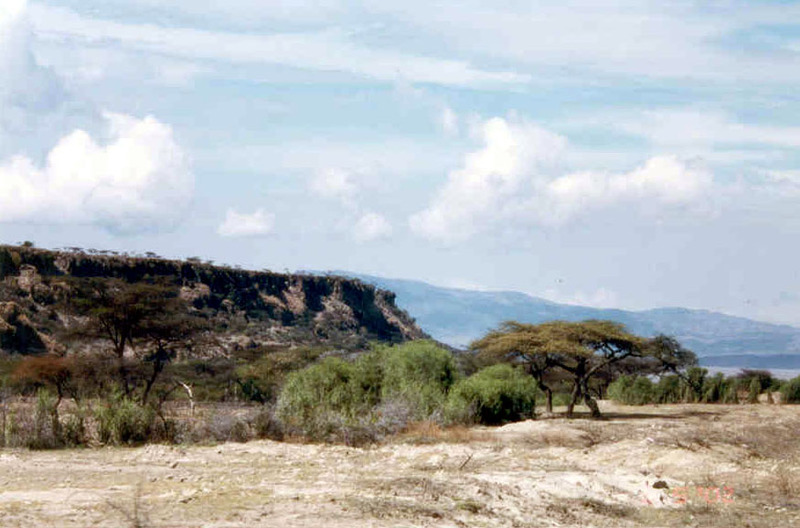 There is something about Africa, life here seems to be flowing so much slower. 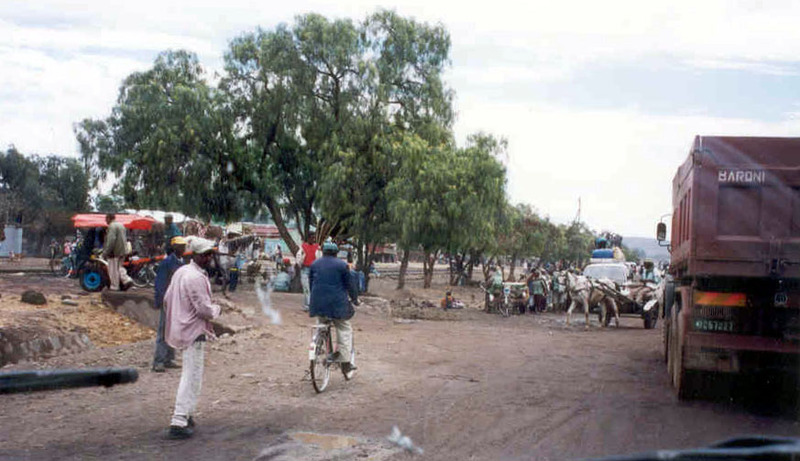 African people say "never hurry in Africa", and that saying really sums up the relaxed way of life here. People have much less than their American counterparts, but they also seems happier. I guess if you don't know what you are missing, you don't miss it after all. Here all you need is a cow or a sheep and a shelter - nobody cares about flashy cars or expensive outfits. I am definitely planning on coming back to Africa, and if you get the chance yourself, go.